wow, does anyone else feel like 2010 is already flying by? can't believe it's this far into january and we've only posted once, oops. also can't believe how gorgeous the weather has been in nyc so far - we walked all over the city yesterday with our light coats on and stopped here for some excellent fish & chips! we've been busy, but not too busy to make homemade pretzel rolls. this recipe is dangerous because when the rolls are warm out of the oven and slathered with a little salted butter or some spicy mustard, you won't stop at just one or two! the dough is from a fall issue of martha stewart and would also be great adapted into sweet pretzels with cinnamon & sugar or dusted with fresh parmesan. experiment and enjoy! in a small bowl, mix yeast, salt, sugar and warm water and stir to dissolve sugar. let sit 5 minutes until foamy. in a large bowl, mix flour and cayenne. use your fingers to cut butter into flour until mixture resembles coarse meal. slowly pour yeast mixture into flour and stir with a fork to combine. use your hands to gather dough together and turn out onto a lightly floured surface and knead until no longer sticky and fairly smooth. return to bowl, cover with plastic and let rise 30 minutes. cut dough into 12 equal pieces and roll each into a ball between the palms of your hands. then roll ball on surface forming into a roll with slightly tapered ends. transfer to an oiled baking sheet and repeat with remaining dough. let rise 20 minutes. preheat oven to 475 degrees F. in a large pot, combine 10 cups of water with baking soda and bring to a boil. boil rolls in batches until puffy about 45 seconds per side. transfer to wire rack to drain. return to baking sheet, brush with egg yolk wash, sprinkle with salt and lightly score with a sharp knife about 1/8-inch deep. bake until golden to dark brown, 13-15 minutes. pretzels will keep uncovered, at room temperature for about 12 hours. rewarm in a 250 degree F oven and serve with salted butter and assorted mustard. Love the rolls. But please, please, please don't say 2010 is flying by. I haven't even decided what my resolutions will be. But perhaps that's my first resolution. To have none. Oh, beauty. These look gorgeous. They remind me of the pretzel rolls we used to get at the farmer's market from the German baker. 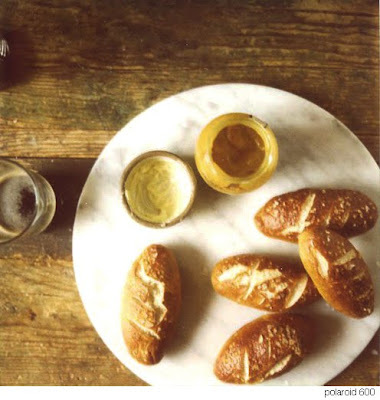 Homemade pretzels and beautiful pictures. Life is so good. new to your blog.....so happy to have found it!! i'm excited to try baking these, thanks! What a treat homemade pretzels are. I adore the rustic feel of this picture. ohhh, i can't stop looking at these. love the addition of the cayenne. my husband would finish these off in one sitting with a jar of mustard by his side. I just bought a tube of spicy mustard (condiments in tubes make me giggle) from an old German store...these will be the perfect delivery vehicle! Those look like something I could really get into :) A little salt and asiago cheese on top, oh boy! Glad nyc has been enjoying some nice weather! All rain over here in Seattle! an early saturday morning here in switzerland, now *this* is what i'd like to make for brunch! warm out of the oven with salted butter - nothing better than that. fantastic! i made these today for brunch and they were delicious. easy to make and easy to eat. thanks for the recipe.